Team Flash comes up with a plan to stop Cicada, but it requires time travel and Barry showing Nora some parts of his life he'd rather not revisit. Meanwhile, Sherloque approaches Cisco with his concerns over Nora and Caitlin discovers a surprising asset to use against Cicada. The episode title comes from William Shakespeaere's The Tempest. Act II, Scene 1. When Eobard Thawne meets Nora, he makes several guesses as to who she is. These include Jesse Chambers (maybe Lawrence) and Danica Williams. Jesse Chambers was the real name of Jesse Quick in the comics, though her mother's maiden name was Lawrence and she did go by Jesse Lawrence for a time. Danica Williams is the name of The Flash from Justice League Beyond. When Thawne realizes Nora is Barry's daughter, he guesses that her name is Dawn. In the Pre-Crisis DC Comics Universe, Barry and Iris had twins - Don and Dawn Allen - who inherited Barry's powers and became known as The Tornado Twins. The Gideon AI in The Time Vault in 2014 recognizes Nora West-Allen as XS and says that she is the fifth recruit for the rebooted Legion. In the original DC Comics Universe, The Legion of Super Heroes was rebooted for the first time in 1994 and XS (who, in this reality, was Barry Allen's granddaughter Jenni Ognats) was created specifically for the new team. Nora suggests creating a weapon more powerful than Cicada's dagger, akin to a super-charged magnet. Cisco says they don't have anything that powerful as the old STAR Labs satellite was was made of a heavy-duty, micro-composite alloy. What Nora's suggestion requires is an indestructible alloy with super-magnetic properties and the ability to negate dark matter. Eventually, they realize they could make such a thing out of a piece of Savitar's armor, the Speed Force transmitter Zoom used to steal Barry Allen's speed and the exact same energy released during the STAR Labs Particle Accelerator explosion. They then need to plant the item near the hospital where Grace Gibbons is resting so it will be accessible in the present. This is known as a time hack. Nora tells Sherloque that the language in her journal is a special time language she invented that is used to record events regardless of changes in the timeline. That way, no matter what happens on her trip to the past, she'll be able to remember what she learned about her father. Sherloque: Look, as always, I respect your spirit, Barry Allen, but as long as Cicada has his dagger to dampen your powers, there's no stopping him. Barry: So let's destroy his dagger. Ralph: How are we gonna do that? Unless we have some kind of... power-dampening dagger power dampener hidden away in storage? Cisco: We don't. But if we did, we'd come up with a much better way of saying that. Ralph: What?! When am I gonna get the chance to do that? Thawne: You know what's funny about your dad, Nora? He hates me. Hates me with a passion. And yet ... a version of him, this Savitar, is a much bigger jerk than I ever was. Killer Frost: Let's dance, cricket freak. Ralph and Sherloque determine that Orlin Dwyer grew up somewhere in the American Midwest, was in and out of the Juvenile Offenders program as a teenager and went off the grid before emerging in Central City a few years earlier. He works part time at Szrek Chemicals. His boss says he keeps to himself, is kind of a lonerand gave a fake address on his application. He was given custody of his niece, Grace Gibbons, after her parents were killed by a metahuman. Sherloque asks Cisco about the code in Nora's journal. Cisco says Barry was writing in the same language when he left the Speed Force in 401, but Cisco was only able to translate one sentence of it - "This house is bitchin'." This turned out to be the first thing Nora said upon visiting Joe West's house in 423. A Time Wraith shows up because there are three versions of Barry Allen at one point in time. Barry distracts it while Nora retrieves the piece of Savitar's armor they need. Nora is stunned to see that Savitar was another version of Barry Allen and that Iris West killed him. Nora sees Iris comforting a disheartened Barry after he's lost his powers. Barry runs Harry Wells in STAR Labs. It is Barry who gives Harry the idea to try and track Jesse Wells by taking advantage of the fact that people from other Earths have different vibrational frequencies. Barry stops Harry from destroying the Speed Force Transmitter. Before Barry and Nora can escape into the time stream, Zoom senses them and chases after them. They are able to evade him and send the Time Wraith after him, but the Speed Force Transmitter is broken in the process. Barry realizes they have traveled slightly further back in time, to the events of 217, when he traveled back a year to get training in going faster by Eobard Thawne when he was still masquerading as Harrison Wells. Thawne repairs the Speed Force Transmitter for Barry and Nora. It is suggested by the way Thawne acts toward Nora that he knows who she is and is just playing dumb to that fact. 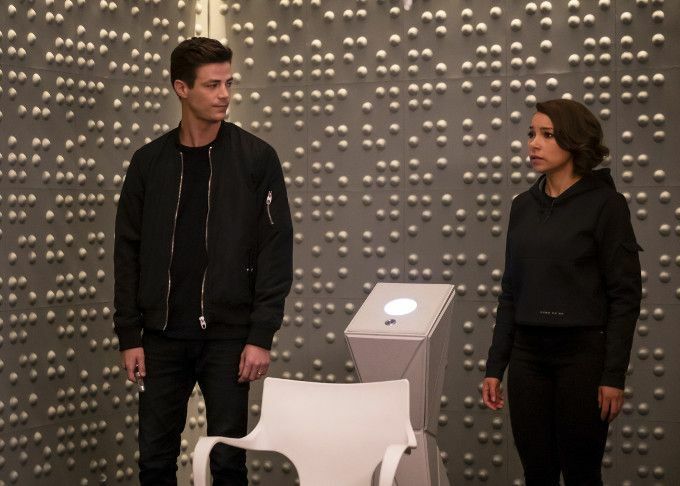 As Barry and Nora sneak around STAR Labs, they go past Grodd's cage. Nora had no idea why Eboard Thawne was her dad's arch-enemy or that he had killed her grandmother. Dr. Ambres is revealed to have been the doctor on duty when Barry Allen and Harrison Wells were brought into the hospital on the night of the Particle Accelerator explosion. Barry vibrates the weapon they've created into the middle of a column in front of the hospital. Cicada's command of his danger has a great enough range that he can affect it even after it has been vibed into space. It is determined that Cicada's powers do not effect metahumans like Killer Frost who were created without being exposed to Dark Matter. Cicada flees before Killer Frost can totally immobilize him. Sherloque asks Nora about the code in her journal. She says it is a time language she invented that can be used to record events regardless of changes to the timeline. Nora goes back in time to see Dr. Henry Allen and Nora Allen on their last night together. Nora is revealed to have been using Gideon in The Time Vault to send her journal entries forward in time to someone else. Nora goes forward in time to 2049 deliver a message personally to the person she is sending information to in the future. The person is revealed to be Eobard Thawne, still in the body of Harrison Wells, who is incarcerated in Iron Heights Prison. Lackluster as a 100th episode and fairly flat as a mid-season finale. Everything of importance happens in the last 15 minutes and nothing really changes apart from us having a more specific idea of why Nora can't be trusted and how Cicada will ultimately be beaten. Still, that teaser for Elseworlds.... wow!